More shock! More awe! It was only last week that Logitech announced it was bringing back the beloved Cherry MX switches for its G610 keyboard, sidelining its own proprietary Romer-G keys for at least one keyboard model. Now Razer's bringing Cherry MX switches back as an option for a new entry in its popular BlackWidow keyboard lineup. Last week I headed to Razer’s office to check out the new BlackWidow X. It’s, quite literally, a stripped-down version of the BlackWidow Ultimate. 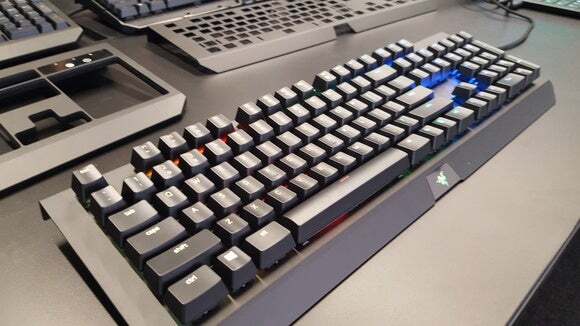 Razer’s removed the top layer of plastic, creating a similar effect to Corsair’s K70/K90 with its exposed metal backplate and protruding keys. The BlackWidow X also ditches the icon-based indicator lights for simple circles. And the typeface. The BlackWidow X is the first standalone Razer keyboard to ditch whatever “FOR GAMING” typeface the keys used before, instead using the same professional-looking lettering found on the Blade Stealth and the 2016 Blade gaming laptops. It’s a beauty of an update, but best of all: You’ll be able to get it with Cherry MX switches. Blues, to be exact. Razer will offer the BlackWidow X with Razer Green switches, Razer Orange switches, or MX Blues. But the real steal is a Cherry-equipped BlackWidow X with no backlighting and no numpad for just sixty dollars. I’m pretty sure that makes it the cheapest Cherry MX board on the market, beating out the longtime favorite of budget-conscious shoppers, the CM Storm Quickfire Rapid. If you’ve wanted MX Blues but were always put off by the price, Razer of all companies has your back. It's interesting of the company to sell the Cherry-equipped models for cheaper, too. On the one hand, it lets Razer position its proprietary switches as the “Premium” model—a narrative it desperately wants to take hold, in the face of Cherry MX brand loyalty. Razer’s spent a lot of time recently touting the “80 million keystrokes” durability of its switches, which beats out Cherry’s 50 million guarantee. But pricing the Cherry boards cheaper also makes it easier for brand-loyal people to choose that over Razer’s offerings. A bit weird. Anyway, we’ll take a proper look at the BlackWidow X in the future—both the Razer and Cherry models. I’m telling you though: That $60 model is a bargain.